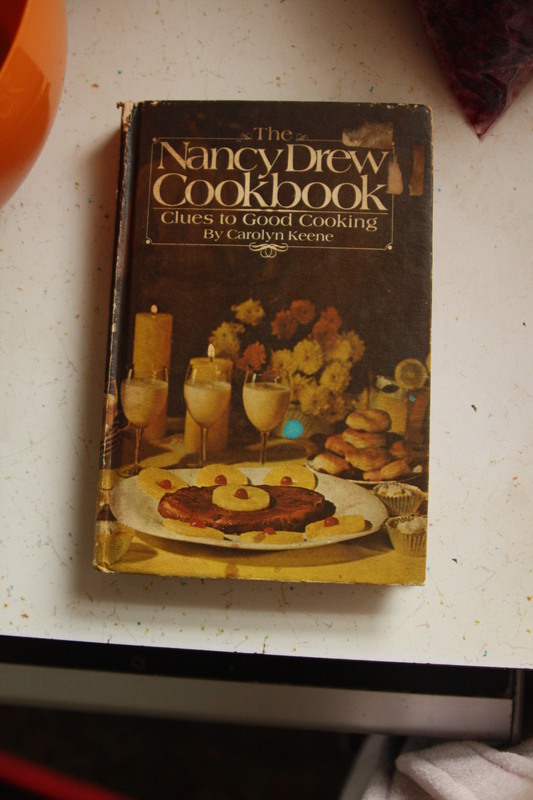 The first cookbook I was ever given was the Nancy Drew Cookbook. I think it was a Christmas present one year, but I can’t really be sure. I remember cooking breakfast out of it in the old farmhouse my parents sold when I was 7. The blue dot on the cover is a color of paint used for the sets one of my professors volunteered me to design for the Miss Glomerata pageant one year in college. (The Glom is the college yearbook that apparently required a beauty pageant in its honor.) I have no clue how it landed on the cover of my oldest & dearest cookbook. The book opens directly to the recipe for “Tapping Heels Griddle Cakes”, an early favorite. 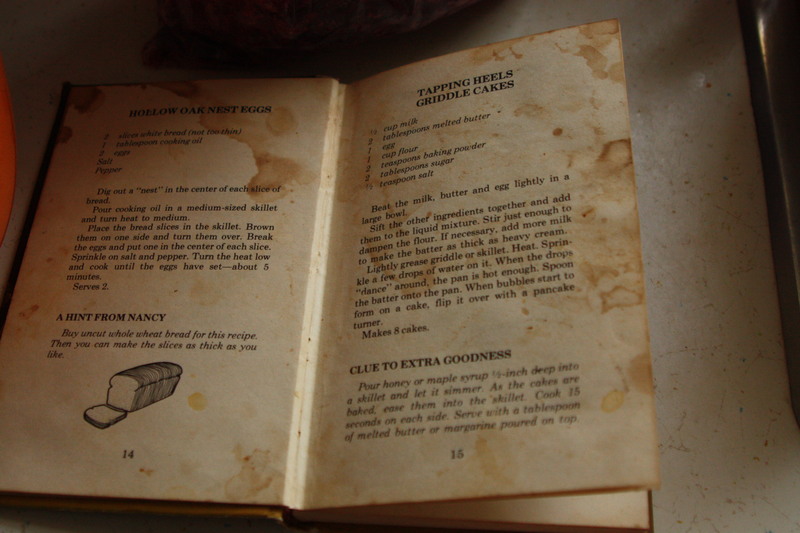 You can always tell the favorite recipes by the stains on the page. The only two recipes I’ve made out of there on a regular basis are the pancakes & the Blackwood Hall Muffins. Okay, the only recipes I think I’ve ever made out of there were those two recipes. Honestly, I was never a Nancy Drew fan as a girl. I read numerous books in the series, but I felt they were formulaic – you read one, you read them all. Interestingly enough, Edie came to the same conclusion on her own when she started reading them a few years ago. The cookbook however, is a different story. Substitute 1/4 cup soya flour for the same amount of regular flour and you’ll add extra protein to your breakfast. That habit I have of subbing a more nutritious whole grain flour for at least a portion of all purpose flour can be directly traced to my very first cookbook. There are hints like that throughout the book – calls to sprinkle toasted wheat germ on your cherry cobbler, using brown rice instead of white. She calls for subbing blackstrap molasses in the hot chocolate (“a great energy booster”), spinach leaves for lettuce in a salad. The Nancy Drew cookbook is far more inventive than any of the books I remember reading about her. It’s also one of the most undercover health conscious cookbooks I own. Sure, you expect the vegetarian cookbooks to have a healthy tone to them, but Nancy Drew was the first time I saw things like wheat germ & brown rice. Who expects that from Nancy? 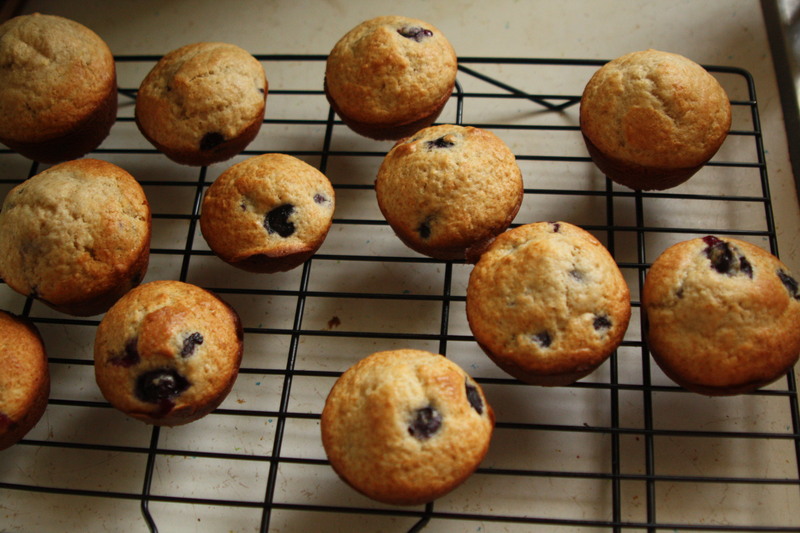 To this day, I’ve yet to find a blueberry muffin recipe I care for as much as the Blackwood Hall Muffin recipe. I’ve only ever made one substitution in all these years of making it – I add a dash of vanilla. I’ve upped the amount of ‘mysterious flavor’ flour I use to 1/2 cup, with my current favorite being spelt flour. These are particularly good with peach butter if you happen to have any laying around. Strawberry jam works well though too. Sift flour, sugar, baking powder & salt into a mixing bowl. Add the butter, egg and milk. Stir with a fork until blended. Toss blueberries with additional flour and stir them into the dough. Pour into muffin cups that have been greased, filling the cups 2/3 full. Bake for 18 minutes or until golden brown when done. Yield 12 muffins. *I sub 1/2 cup spelt or whole wheat flour for all purpose and add a little more milk, as whole grain flours can absorb liquid quickly. Mine was my mother’s Joy of Cooking for Kids. It was worn and tattered and contained MANY casseroles and tips to have food ready for your father/husband when he got home. So funny to read it now! I love Joy Cooking! I have a few editions. I have a Fannie Farmer Jr. cookbook, but not a Joy of Cooking for kids. Something to keep an eye out for! I didn’t even know there was a Nancy Drew cookbook! How sweet it is that you still have it. 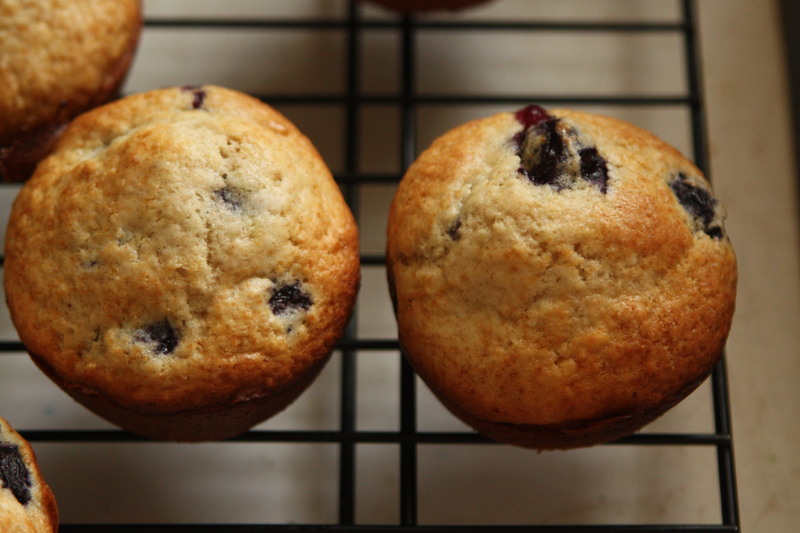 It’s got my favorite blueberry muffin recipe! Of course I have it. Awesome! I’m pretty sure I checked this out of the library once or twice, but I don’t think I ever made anything from it. 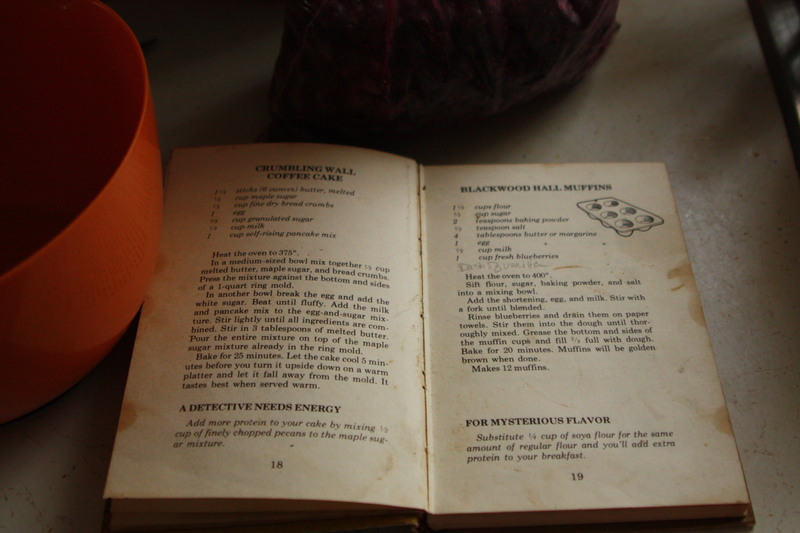 I never would have expected subversive health food substitutions in the Nancy Drew Cookbook! I know, right? The more I look through the more I realize how creative it is! If only kids cookbooks were written like this today!